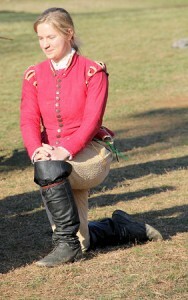 Caitilin joined the SCA in September 2004 and authorized for rapier for the first time at the Battle of Three Kings in Ansteorra in November 2004. Much of her first years were spent in the Shire of Shadowlands; attempting to breathe life back into the TAMU SCA student organization. Her proudest achievement there was partnering with Opera and Performing Arts Society to pair SCA demos with the theater performances OPAS brought to the community. There were also a couple of failed attempts to try to kick off a theater guild in the shire, but she is still hopeful the next time it will work! November 5, 2005 she received the unofficial shire award of the “Order of the Shadow.” Which came with a pie sized chocolate chip cookie and a scroll. She has it framed and hung on her wall today; the scroll that is, the cookie was eaten long ago. To her knowledge she may have been one of the last recipients of this honor. 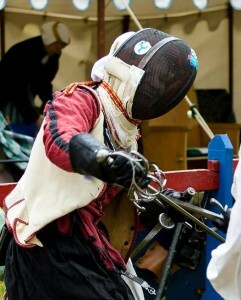 Additionally she was one of the founding members of the rapier household of Castilion di Elba. Her time in Ansteorra is second most known for her dedication to traveling to a variety of practices across the kingdom each week. This a trend that would only expand as today she takes every opportunity to travel to out of kingdom practices. She had spent some of her time in the early years working with some of the members of Tattershall to study of Capo Ferro, Marozzo & Dall’Agocchie. These historical studies would be short lived, but would influence all of her work to come. At Gulf Wars in 2006 she was selected to be a non-scarf champion for Ansteorra and was the only non-cadet on the team. 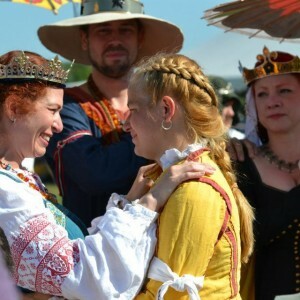 She proudly won that first Champions fight and has competed in many subsequent champions tournaments at Gulf Wars and Pennsic. At Stargate Yule on December 2, 2006 she cadeted to Don Tristan von Heidelberg. It was around this time she started her “beautification projects.” This consisted of at cost sewing and armoring for non-peers in her group who needed assistance along with the war sweatshops. She studied under HL Anne Barrington and Dakao Do. Anne and her later taught a class on “Protective Equipment for Rapier Combat” which included everything you needed to know and didn’t want to know about rapier armor, how it worked, where to get it, or how to make it. A few events later she would receive a Sable Thistle for costuming. She is known in Ansteorra for her variety of capers used to make life interesting; they varied from a glitter bomb execution to an unsuccessful attempt to kidnap a king. At the 30th Anniversary of the White Scarf event she hosted the Cadet Prank tournament. In 2008 she would run the list for the first Everyman tourney and again at the second Everyman tourney. In 2009 & 2010 she was the MIC for the Everyman, turning it over in 2011 to Will Paris of Aethelmearc. In conjunction, she was also the land coordinator for Lantern Guard at Gulf Wars those same years. Her final event in Ansteorra was the Battle of Three Queens in October 2009. She joined the Dragoons on August 22, 2010. In 2011 she started working behind the scenes to organize the Blacksword tourney data and the annual schedule. Later in 2011, in what was meant to be a small joke, turned into Loch Sollier’s Rapier facebook page. She is still the main admin until this date. In March of 2011 at Defending the Gate she became a scholar in the Academie d’Espee. Later that month she became the Baronial Rapier Champion for the Barony of Ponte Alto. In May 2012 she became the XO for the Atlantian Rapier Army. Her first Pennsic champions fight ended with a victory in less than 3 seconds and was the same day she became a member of the Order of the White Scarf. Currently she continues to travel to as many kingdoms and can, as often as possible. She has become a student of society rapier politics and with a goal to of developing a diverse understanding of rapier cultures throughout society. She has two younger cadet sisters coming up in the ranks Angeline Falconis and Solia Corsali.